What camera slinging aspiring pro photographer wouldn't want to be a part of a "Photo Quest" these days? A "quest" conjures up Indiana Jones-esque expeditions for the perfect picture - explorers searching for just the right photo to satisfy the "photo gods of exposure." Who could be so ignorant or desperate? Apparently quite a few, like the natives worshipping a false sun god because of a solar eclipse. Some 840 clueless photographers submitted 6,000 images for the chance at winning the "great honor" of having their creative work product commercially exploited along with 50 others whose work was selected for a FOR PROFIT Lonely Planet book, according to MobileMarketingDaily - "500px Launches Photo Quests, Allows Brands To Crowdsource Original Content" (5/23/16). We've written extensively here at Photo Business News about the seriously flawed "SPEC" business model, yet, these models continue to proliferate, counting on photographers (pro and amateur alike) to line up like lemmings and mindlessly follow each other over the cliff of unsustainability. In February of 2015 we wrote "ImageBrief: A scourge on the photographic industry" yet photographers continue to ask questions in various photography forums. Advertising agencies and design firms are using predatory content resellers like Image Brief to source free ideas and content for their pitches, before they even are awarded the projects. One photographer on the STOCKPHOTO listserv reported watching 50 different briefs and none of them were awarded. According to that same poster, Image Brief is now charging photographers to make a submission for the "privilege" of consideration. Photographers following these models are destined for failure or otherwise are ignorant to the realities of being in business. According to the MobileMarketDaily article, "...it allows photographers a chance to have exposure on a much larger scale than they may readily have access to." What is especially troubling is that the article cites Canon as one of the brands that has run a "Photo Quest", and had thousands of submissions. Jim Pickerell, over at Selling Stock (subscription required) reported back in April "Drastic Royalty Cuts Change Photogs View Of 500px" reports that photographers are now only getting a 30% royalty on licensing of non-exclusive images. Consider the concept of "agents" in other businesses, like actors, book agents, and musicians, for example. Their commissions hover around 20%. The idea that organizations like these can take 70% (or more) and leave the creating artist with a pittance, is just abhorrent. Especially when you're one of several participating in the "quest" and standing a one-in-many chance of winning the gross, and then having to take a pittance of income as your paltry percentage. Less than a year ago, Visual China Group led a $13,000,000 round of funding (source) and Visual China Group is most recently known for acquiring the assets of Corbis Images and then folding them into their other investment - Getty Images, as we reported here (Corbis Sale to Unity Glory (and Getty)). This money must be being used to buy servers and hard drives for all the hopeful photographers, as well as the overpaid sales agents - Glassdoor reports (here) that a Product Marketing Manager earns over $80,000. How is that reasonable at a company which has, according to LinkedIn "51-200" employees and Glassdoor currently has 18 job openings? It seems everybody is earning a very nice living on the backs of the starving-artist photographer. These organizations will eventually find that the crowdsourcing/"Photo Quest"/ImageBrief model is not a viable solution, but by then the hopes and dreams of photographers will have even been further dashed, and content consumers like ad agencies and design firms will be further down the line of devaluing photography. 500px is apparently intent upon flushing the photography business down the toilet while reaping profits from their deals with large corporations seeking content and ideas for pennies on the dollar, if not free. Getty images is getting "up to $100 million" according to Reuters (here) from Visual China Group, which might seem like a lot, but, in review, is really not. In 2015, Bloomberg Business reported on Getty's cash situation, in "Getty Images is Running Tight on Cash" (2/25/15). What was reported was that, in the last quarter of 2014, Getty "depleted a third of its cash during the last three months of 2014, leaving it with $27 million...". That meant that Getty had $41M, or is burning through about $4.5Million a month. This may well not include payment in a $2.6 billion debt service. However, a $100 million investment amounts to just 3.8% of the $2.6 billion that Getty is in debt, and there is no sign that the blood-letting is coagulating. Getty already received $100 million in November 2015 ("Distressed-Debt Lenders Aid Getty Images in Battle Against Shutterstock", 11/5/15) from distressed debt lenders known to prey on troubled companies. "TheStreet Ratings rates Carlyle Group L P as a sell. The company's weaknesses can be seen in multiple areas, such as its deteriorating net income, disappointing return on equity, generally disappointing historical performance in the stock itself and feeble growth in its earnings per share." For those in the financial services sector, it's just one more business to watch the numbers on. For those in the trenches of the industry Getty serves, Getty Images is dying a slow and agonizingly painful self-inflicted death. It's like the shrewd investor analyst who actually goes to the farms in Kansas and sees first-hand the crops with lower yields, and gets out while they still can. 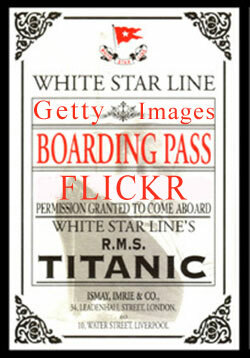 Getty Images is near that point where the ships' hull is about to break apart, just like the Titanic. Many with knowledge of this industry know just how low the metaphorical visual "crop yields" are, and just how underperforming Getty Images is to the Carlyle portfolio. Corbis wasted no time detailing to photographers how the transition from being a Corbis photographer to a Getty Images photographer will take place, in an email sent out with a FAQ. While the FAQ went into great detail. What was abundantly clear was that Corbis will no longer exist in short order. 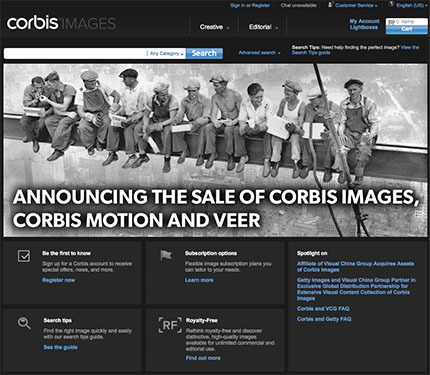 Yesterday, Photo Business News detailed the sale of Corbis to Visual China Group (SHENZEN: 000681) subsidiary Unity Glory as well as the same-day announcement of what clearly looks like an end-run around anti-trust laws by Carlyle Group (NASDAQ: CG) when they announced the worldwide exclusive arrangement with Getty Images. I wanted to send you all a note about the sale of Corbis. My last day will be February 5th. I will do what I can to help you guys out in that time. Anil will be on for a while longer as well to help with the transition, so anything I’m not able to do you can reach out to him. We are still waiting on the exact details of how this would work. When will I know if I’m being offered a direct contract with Getty Images? Invitations for direct contracting and content migration will take place over the course of the coming weeks, once all invitations have been delivered, contributors will be notified that the process is complete. What happens to those contributors who are not invited to join Getty Images? Contributors who are not invited to sign directly with Getty Images will remain contracted to VCG according to the terms of your Corbis agreement. At VCG’s discretion these contracts may be offered termination, in which case you will be notified by VCG. Regardless, you are welcome to apply to work directly with Getty Images through the Work With Us application process (http://workwithus.gettyimages.com/en). If Getty Images does not offer me a contract, or I don’t want to sign with Getty Images, will the Corbis contract continue with VCG? Yes. Contributors who are not invited to sign direct with Getty Images, or choose not to, will remain contracted to VCG according to the terms of your Corbis agreement. At VCG’s discretion these contracts may be offered termination, in which case you will be notified by VCG. 1. If you may want to sign on to Getty just sit tight and someone will reach out to you. In it say you want to terminate your contract, to pull all your images, and that you want no survival rights on them. It will be up to VGS/Getty weather they will honor that or make you wait out the remainder of your contract. But that is the first step and it will be on record. If you have any other questions please let me know here. Its been great working with you all and I look forward to the next journey. Today Corbis is announcing the sale of the Corbis Images (excluding Splash), Corbis Motion, and Veer licensing businesses to Unity Glory International, an affiliate of the Visual China Group (VCG), a leading Chinese visual communications and new media business. In connection with this transaction, VCG is excited to announce the expansion of its longstanding partnership with Getty Images, and, following a transition period (which we’ll explain in more detail), Getty Images will become the exclusive distributor of Corbis content outside China. Today, Corbis announced the sale of its content licensing business to Unity Glory International, which is an affiliate of the Visual China Group (VCG), a leading Chinese visual communications and new media business. This sale includes the images and motion archives from Corbis Images, Corbis Motion, and Veer, and all their associated brands and trademarks. The sale does not include the Branded Entertainment Network, Splash, or Greenlight, its rights clearance and representation business. 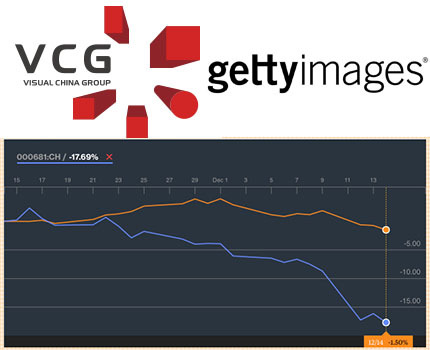 Subsequent to the sale, Getty Images, the world leader in visual communications, and VCG announced a global distribution partnership which will see customers globally benefit from an unprecedented content offering. The existing Getty Images collection of almost 200 million images spanning creative and editorial, stills and video, contemporary and archival, is expanding to include Corbis imagery, video and historic archival content. This content will be available to customers in China via the VCG platform and to the rest of the world via Getty Images’ global sales teams and industry-leading website, gettyimages.com. What is Unity Glory/VCG acquiring? Under the terms of their agreement with Corbis, Unity Glory/VCG is acquiring the assets and brands of Corbis’ Images division, one of the world’s leading image archives and licensing businesses. 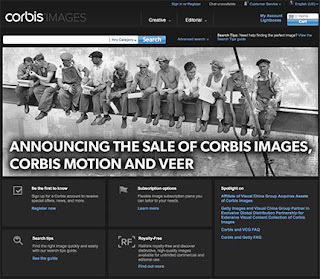 Going forward, it will own and manage the images and motion archives, names and trademarks associated with the Corbis Images, Corbis Motion and Veer licensing brands. Corbis is not selling the businesses in its Corbis Entertainment division, so, going forward, Corbis Entertainment will continue to own and operate its Branded Entertainment Network, Splash and Greenlight, its rights representation business, under a different brand. Getty Images is the trusted partner to a network of over 200,000 contributors and content from approximately 330 existing image partner relationships, including prestigious partners NBC Universal, BBC Worldwide and AFP. How will the VCG/Getty Images deal benefit me? Corbis content will reach a wider audience throughout the world via Getty Images’ industry-leading site and global sales team, and in China via VCG. Editorial contributors will benefit from being part of our global award-winning editorial team, covering the most exciting, important and interesting things happening 24/7 around the world. Contributors with archive and historical content will benefit from working closely with our dedicated team of global archive editors and will be represented alongside some of the most important names and collections in the history of photography. Will Getty Images migrate all of my content or just a smaller selection? Content selected for migration will be case by case - some entire portfolios will be invited for migration and others will be partial selections. What criteria will Getty Images use to select the Corbis content it will invite for migration? Content selection for migration to Getty Images will be based on a variety of criteria including license history, uniqueness, quality and exclusivity of content. What are the specifics of the agreement I’m being offered by Getty Images? In general, standard Getty Images agreements will be offered, but it is understood that in some cases there are unique circumstances that will need to be addressed. So what is happening to the Corbis site once content has been migrated to Getty Images? During the transition period, VCG and Getty Images will evaluate how best to improve the value and benefits for Corbis customers globally and will reach out to customers in the coming weeks. Can I still submit content to Corbis during the transition period? There will be a short window of ongoing submissions but we want to ensure there is time to process content that is currently in our production queues. We would advise you do not submit further content if possible and instead wait for Getty Images invitations. Once signed to Getty Images you will have access to direct submission processes there. I want to terminate my contract with Corbis, how do I do this? Your contract has been re-assigned to VCG as part of this transaction, the same termination terms and process remain in place. Please refer to your contract for specific information. 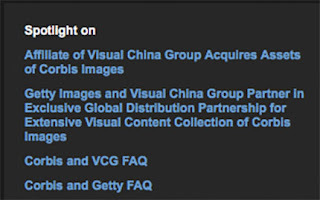 The sale of Corbis to Unity Glory, a Beijing China headquartered company, and the simultaneous announcement that Getty has an exclusive global distribution partnership with the parent company - Visual China Group, foretells the continued demise of the stock photography industry, and as well, Getty Images. "NEW YORK (January 22, 2016) - Getty Images, the world leader in visual content and communications, and Visual China Group ("VCG"), a leading Chinese visual communications and new media business, today announced an exclusive distribution partnership that will enable Getty Images customers to access the extensive visual library from Corbis Images." "VCG and Getty Images will immediately begin work to migrate Corbis content, with migration to be completed as quickly as possible to ensure a seamless transition for customers, contributors and other partners." 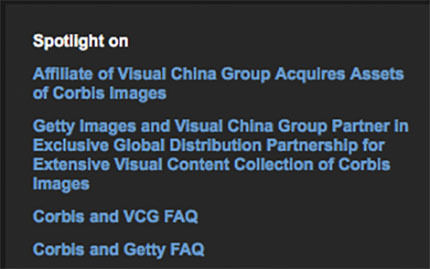 Announcement of VCG acquisition and Getty Images exclusive deal on front page of Corbis website. Consider the optics of the above. Corbis is calling Getty "...the world leader..." Corbis is no longer competing with Getty, this sentence alone makes that clear. So why do this? Simple. Anti-trust. 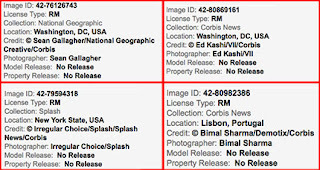 Several years ago, Getty investigated the viability of buying Corbis directly, according to sources familiar with the due-diligence efforts at the time. However, both U.S. and U.K. anti-trust laws prevented it at a time when Getty was trying to acquire both Corbis and Rex Features. This joint announcement of the sale of Corbis to a Chinese company, and, simultaneously, the announcement of the exclusive distribution partnership is clearly an effort to skirt anti-trust laws. November 3rd, 2015 Getty announced they struck a deal with creditors, which, as Bloomberg aptly notes has "...been struggling for cash amid a price war with newer rivals, is getting a lifeline from investors known for profiting from distress." (Distressed-Debt Lenders Aid Getty Images in Battle Against Shutterstock, 11/4/15). 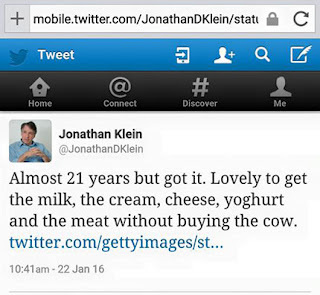 Getty co-founder Jonathan Klein boasted about the acquisition of the exclusive rights deal on his twitter account. Let's dissect his tweet. "Almost 21 years, but got it." - He's referring to his long-term plan to acquire Corbis Images. "buying the cow" refers, of course, to a purchase of Corbis outright. He's happy he didn't have to buy it. 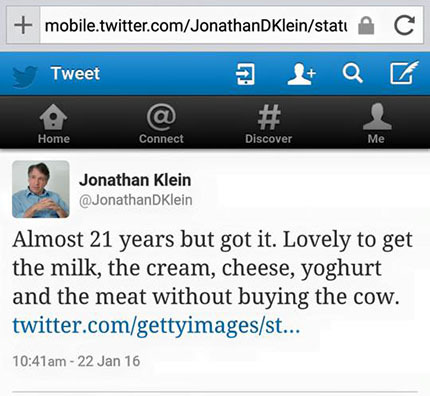 Now comes the really offensive part: "the milk, the cream, cheese, yoghurt and the meat" - what exactly is he referring to? That's right, the intellectual property rights to the material produced by Corbis photographers. Getty now has the exclusive worldwide distribution deal for all of Corbis' content. For anyone owning or being a distribution partner of Corbis, what does this mean? So if you're an individual photographer represented by Corbis, EVERY image licensing fee you will get will now be half of what it was. (this assumes the standard 50/50 deal, some places are 60/40). So if you're an photographer with agencies that distribute through Corbis, EVERY image licensing fee you will get from your agency will now be half of what it was. (this assumes the standard 50/50 deal, some places are 60/40). If you're a photographer currently represented by a sub-agent who distributes through Corbis, or even directly with Corbis, assuming all other things being equal, you'll want to cancel your representation by the sub-agent or with Corbis, and transfer all your images to a Getty contract. This seems to be the only way you'll keep your revenue percentages. There's nothing anti-trust that would jeopardize Getty when individual photographers (or even agencies) move to Getty directly and cut Corbis out the the middle. With all content on Getty from Corbis in short order, it's not going to change your sales quantities, just your net bottom line revenue. What is not clearly known is what investor arrangement Getty has with VCG behind-the-scenes, if any, beyond the revenue share from each license. How has Getty and the Carlyle Group (NASDAQ: CG) structured this deal? And, to what extent is there a financial arrangement that could risk an anti-trust claim between Carlyle and VCG? Further, this will increase Getty's library substantially, but only at a percentage of the total. With Getty as a subsidiary of Carlyle and VCG a Chinese company that can't really be reached by U.S. anti-trust claims, Carlyle could be in a position where they are left holding the bag on an anti-trust charge, even years after Getty Images is gone (or sold) and no company that might be interested in acquiring Getty Images from Carlyle would be interested in purchasing the liability of an anti-trust lawsuit, which would then make Getty's position with VCG a poison pill for as long as the shadow of anti-trust issues persist. The revenue share between VCG and Getty is not known, but Getty will only be getting a percentage - is that going to be enough for Getty to survive? Likely not, it will just stem the bleed-out of the dying corpse. One other thing that will come up is how Getty Images ranks search results. When Getty Images assigns a photographer to cover the Tony Awards in New York City, they will also be distributing the images from Agence France Presse. Getty just announced yesterday - Getty Images and AFP renew leading content partnership (1/25/16). An AFP staffer may not care that this deal happened, if they're not getting a revenue share from the licensing of their staff-produced content, but make no mistake about it, if a Getty, and AFP photographer are covering the Tony Awards, Getty wants their content to appear first in search results because they don't have to share the revenue with AFP if an editor selects a Getty image during the first returned results. As such, if you're a Corbis (or Corbis sub-agent) photographer, your work will likely also appear below the Getty images in the search results. 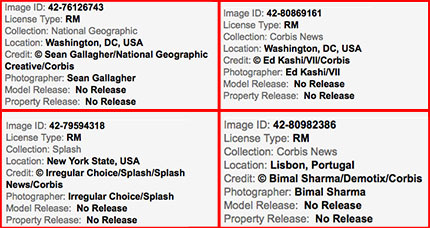 So, if both a Getty and Corbis photographer are at the same event, the images from the Getty photographer will "push down" the Corbis photographer results, and so the Corbis photographer should rightly see the Getty photographer as cutting into their revenue stream. In addition, any sponsorship deals that Corbis had, are now at risk. For example, the Look3 Festival of the photograph website states "Without the support of our sponsors, contributors, & patrons, LOOK3 would not exist." Corbis was one of the major funders for Look3, and that deal could now be in jeopardy. All around, this is a really really bad deal for photographers, and a good deal for Unity Glory and Corbis. And, to top it off, the vast majority of the Corbis employees (especially in the U.S.) have been laid off and only a few remain to clean up the mess that's left.